Smt. Padmavathy Ananthagopalan, one of the foremost vainikas of our times, hails from a family of musicians. Her ancestors are the direct disciples of Saint Thyagaraja and it is no wonder that music runs in her blood. The only Veena player in a family of violinists, Padmavathy is the sister of the illustrious Violin maestro, Sri Lalgudi G. Jayaraman. Her father, Sri.V.R.Gopala Iyer, meticulously trained her from a very young age. Her brother has also been a constant source of inspiration and guidance. Living in an environment of culture and tradition, Padmavathy started performing at the very young age of 12. Ever since, Veena has been her life, her passion, her everything. She has evolved a style of her own based on the gayaki style and literally sings on her instrument. She has performed in all the major organizations in India. Padmavathy considered Padmabhushan Late Dr. S. Balachander as her ‘Manaseeka Guru’ – her source of inspiration and was also privileged to perform along with him. She worked for 8 years in the Indian Fine Arts Society in Singapore and brought about a revolution in the science of teaching there. During her tenure, she brought out Music text books in the name of ‘Shadjam’ and ‘Rishabam’. She returned to India in 1983 and established a school exclusively for music in Chennai in the year 1988 known as ‘Sri Satguru Sangita Vidyalaya’. The Vidyalaya has been functioning very successfully for the past 25 years and has turned out highly proficient students. Apart from being a great performer, Padmavathy is a very great teacher and many of her students are successful concert performers in Veena, Vocal and Violin. Recently she authored a series of books for students of Carnatic Music known as ‘Abhyasa Manjari Part 1 and 2’. Following this successful venture, she came out with a series of cassettes known as ‘Abhyasa Ganam’. She has also been instrumental in popularizing Carnatic music among the audiences in Anna Nagar, Chennai by initiating an organization called Annanagar Music Circle and has been conducting regular monthly concerts very successfully for the past 28 years and thereby making available to the rasikas, the cream among Carnatic musicians to come and perform at the sabha. Padmavathy is an ‘A’ Top grade artist and has been featured regularly in the AIR and T.V. networks. She has toured the United Kingdom, United States, France, Switzerland, Malaysia and Singapore. She has performed in the Cleveland Thyagaraja festival in the year 1995 and she was invited for the Thyagaraja festival held in Paris. “Veena Thathwagnya” by the Veena Foundation; New Delhi. She was honored with the TTK award by Music Academy, Chennai in 2006. Padmavathy is constantly researching and is coming out with innovative ideas to popularize the Veena all over the globe. She has designed a new portable Veena. She has solved the long existing problem of transportability of the Veena without it losing its original tonal value by making the Veena portable wherein instrument can be dismantled and carried very easily to any part of the world. 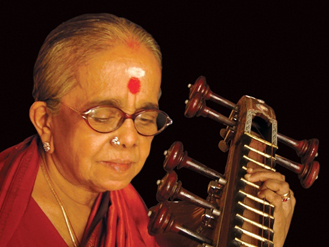 At 80, Padmavathy continues untiringly to spread the message of Carnatic music and Veena all over the world. S. Balachander, born in Madras on 18th January 1927, enjoyed the privilege of having had ancestors who belonged to and lived in Tanjore area, acclaimed as the seat of culture and fine arts in South India. From the very early age of five Balachander started showing very great interest for Classical Music, and a greater desire to play upon some musical instruments. The first one he ever attempted upon being a Kanjira, a small circular percussion instrument. A child prodigy as he was, within one year of practice, he started accompanying his brother (a merited vocalist) and other musicians on the Kanjeera during regular concert engagements, in sabhas, in temple festivals, in devotional congregations, etc. From that early age of six started Balachander’s career as a concert musician on a steady growth, from day to day, from success to success, from instrument to instrument. To explain the last, one after the other, Balachander –untutored – learned to play, as the years rolled by, several musical instruments ranging from Tabla, Harmonium, Bul-bul-thara, Mridangam, Thar-shenai, Dilruba, Tabla-Tarang and Sitar. 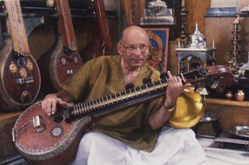 In Sitar, he was a full-fledged solo-concert-artiste between his age of twelve and Sixteen, and on Sitar (The North Indian instrument) it is interesting to note that Balachander performed south Indian classical carnatic music. From the age of fifteen, for nearly three years, Balachander served as an artiste in the staff of “All India Radio”, Madras, where he had the unique opportunity of playing on all the instruments mentioned above, during broadcasts almost daily, rivaling in solo recitals, participating in orchestral ensembles, accompanying several artistes, deliberating on Rhythm as a weekly special program on percussion instruments alone, and composing and conducting musical pieces of his own. This hectic period of playing on all these instruments came to a sudden end – an end brought off by the entry of Veena into Balachander’s life. This also coincided with his leaving the services of “All India Radio”. Realizing the greatness of this wonderful instrument, the Veena, Balachander felt from the first moment he started playing on it, that this instrument demanded his undivided attention, his every skill, his utmost concentration, and his profound respect. This resulted in his becoming an established concert-Veena-player within two years of his taking up the instrument. Though Balachander did not have any master or tutor, even to guide him during the initial stages of Veena-playing, he has never for once felt it as a handicap. In fact, he said, on the other hand – “By the grace of God, it gave him the unique opportunity to practice on his own, strive by himself, and ultimately bring credit for himself for his achievement of having evolved a new trend, and a new style, and a new school of Veena-playing”. Balachander has thus created a style of his own, considered and accepted to be hitherto unknown unattempted and unexcelled. Balachander is also credited with the great achievement of having secured a unique place for Veena as a ‘pucca’ concert-instrument (on par with even the concert vocalists), where tens of thousands have come to hear him during some of his recitals, whereas prior to this Veena was treated mainly as an instrument for ‘chamber-concerts’ for the benefit of only a selected few listeners. He was awarded the Padma Bhushan, India’s third highest civilian honour, in 1982 for his contribution in the field of Arts. Hence, it is no wonder that Balachander was considered to be one of the topmost Veena-players of India today, in the exposition of classical carnatic music. He also possessed a substantial knowledge of North Indian Classical Music, apart from having a keen sense of appreciation for western classical music. As a composer and a conductor of his own musical works, Balachander created music for certain choice films, and orchestral pieces for and from ‘All India Radio’ stations. Such of his compositions, which are rare in their variety and beauty, are earnestly sought after, eagerly awaited for, and extremely appreciated. But, it is the ‘Veena’, in his own words and true feelings which was his uppermost, his life. His life, his everything.